Given half the people on our team are certifiable word nerds, it’s fair to say RedPoint is pro-reading. When Calgary Reads chose to work with us on their first ever The Big Book Club event, it was a big deal. Their office is a dreamland of colour, kids’ books and candy. We never wanted to leave. But there was work to be done. 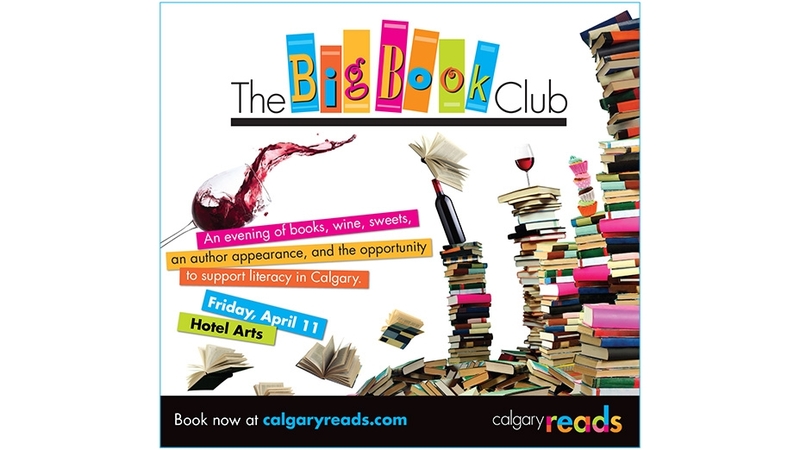 The Big Book Club, which happens on Friday, April 11, is going to become an annual awareness and fundraising event for Calgary Reads. It’ll bring together book lovers, wine and snacks, feature guest author Will Schwalbe and emcee Dave Kelly, and showcase a book marketplace. Proceeds will support Calgary Reads early literacy programs and initiatives, including volunteer tutors for children struggling to read. To spread the word about The Big Book Club, Calgary Reads needed a unique logo, print and digital ads and a sponsorship package. That’s where we came in. The logo was key, because it would inform the design of (and appear on) all the other materials. Art director Dave Willicome took a close look at the existing Calgary Reads brand, with its cheerful, colourful visuals, and came up with three logo concepts. When we presented the concepts, we were surprised when all three Calgary Reads representatives immediately connected with one. It was the “bookshelf” logo, with a row of books on a horizontal line that resembles a shelf, their spines spelling out “Big Book.” The books — simple bands of colour — tip and lean, and the lettering is a playful mix of fonts, in keeping with the enthusiastic, inviting Calgary Reads brand and its focus on children’s literacy. It’s always rewarding to make a client happy, and doubly so when its in support of a project like The Big Book Club. Love reading? Think literacy improves lives and communities? Get tickets to The Big Book Club at Hotel Arts.